All of the forest animals choose Unicornio as the King of the Enchanted Forest. The animals think Unicornio is kind, smart, brave and strong but Unicornio is shy and doesn’t think he’s any of those things. Dora and Boots must prove to Unicornio that he can be King. Dora and Boots are at the beach when they see Diego riding in on a dolphin. He just went on an undersea adventure and found the legendary lost continent of Atlantis where he finds out why it disappeared from the Earth. Diego recruits Dora, Boots and King Unicornio to help him end an ancient feud between unicorns and dragons as it’s the only way to make Atlantis rise. Dora and Boots are playing in the leaves on an autumn day and Little Rabbit from the Enchanted Forest arrives to ask for their help. When King Unicornio returned from Atlantis to the Enchanted Forest, Owl didn’t want to give back the king’s crown, so he tricks Unicornio. If Unicornio doesn’t plug up the dam with his horn, the whole forest will flood! Meanwhile, Owl is still ruling over the Enchanted Forest and making new rules like banning scarecrows, gnomes and fairies from the forest. Dora and Boots set out to rescue Unicornio from the Owl. Emma’s eyes gleamed with delight when I showed her this Dora DVD. Neither one of us had heard of this particular DVD so we were excited to see what it was about. If your little one loves Dora and likes unicorns… this is a winner! I think it was a-dora-ble! 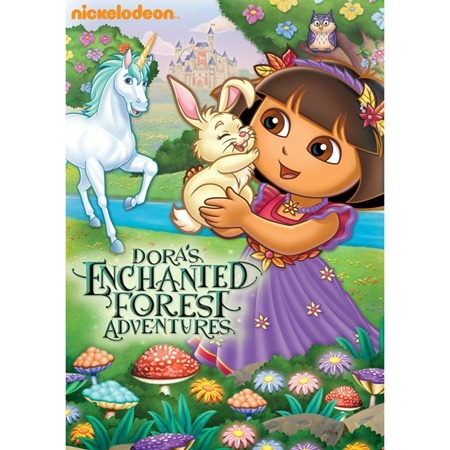 ONE OurKidsMom reader is going to win Dora the Explorer Enchanted Forest Adventures on DVD! This giveaway ends at 11:59 PM EST on September 28, 2011. I like the cool crafts. I like the recipes! I’m always willing to try something new for my family! One thing I learned from that site is that I lose my computer when I go there…haha… I also saw what kind of games are on there and videos. I loved the reciples, I can’t wait to try my hand at the Dora the Explorer Sandwich. I like the cute craft ideas. I learned that in each episode, Dora invites young viewers to join her on an adventure or an exploration with a clearly defined goal at the end. Using Map to point out the stops on the way, Dora and the viewer must solve problems and overcome obstacles along the way to their goal. At the end of each episode, Dora, the viewer, and Dora’s friends, celebrate with Dora’s signature “We Did It” dance. I like how interactive it is! My daughter LOVES Dora..thanks for the chance! Oh..forgot to mention that anything and everything Dora is great on the site…my daughter loves Dora…she just turned to 2 and carries her Dora and boots around all the time. My little girls would just be tickled pink with Dora’s ballet adventures DVD. Thank you! I like the Get Ready for Kindergarten quiz. My son already loves to go on Dora’s site and watch the videos and play the games! Visited the dora website and I love the recipes. I like the Dora sandwiches. I love the recipe section including the Dora sandwiches and cupcakes. How cute! I want to try to make that cute Boots poncho from the website. I learned they have printable worksheets to help you teach your kids things like colors, ABS, and shapes. I love all the dora craft idea! Like the boots no-sew snuggle pillow! I like the Dora Cupcake Rings. I want to own the entire Dora DVD collection! I like the boots no-sew pillow. I might just make this for my niece for Cmas. She is obsessed with Dora! I like the Dora Recipes! i like the music/sound effects.. 🙂 and the game thingy section for kids. Love the Dora Crafts Section! I follow your blog on GFC, subscribe to your email and like you on Facebook! I would love to win this for my daughter! Thanks so much for the fantastic giveaway! I love that they have a section for crafts! I’m always looking for crafts to do with my little ones. Thanks for the chance to win! I would love to try the Dora Sandwich! I love the craft section. I am always looking for fun activities to do with my daughter. I didn’t realize Dora had a magazine and I want to get that! Love all the crafts and recipes! And stuff like printables! My kids love the coloring pages. I love the games and printables! I learned that there’s a recipe to make a silly-looking Dora sandwich. LOL! I love the party planning section, lots of printables for your Party! I like the Boots No Sew Pillow craft idea! It would be fun to make some of the recipes, like the cupcake rings. I want to make the boots cake for my little ones – so cute! I learned they have coloring pages! Love the Dora crafts like the Boots Tshirt Poncho. SO cute.